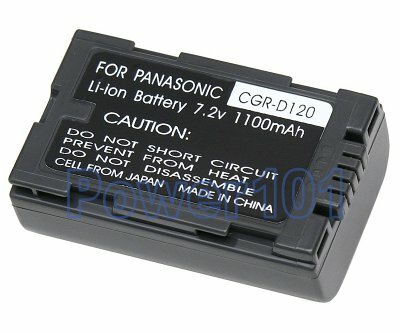 CGR-D120 is the smallest battery in the compatibility series of D120 D220 D320. Usually D120 is rated at 2 hours, D220 at 4 hours and D320 at 6-8 hours. D120 is the smallest and D320 is the largest with D220 being the best choice for most users due to its size and runtime. For most users, we would recommend D220 over D120 or D320. D220 is not much larger than D120 - which makes it still look aestetically nice. It lasts more than 3 hours and most events usually last less than that. One D220 is definitely more convenient and cheaper than two D120 and looks a lot better on the camcorder than a D320. Sometimes these batteries are referred to as CGR-D08A CGR-D16A and CGR-D28A. These are older names for D120 D220 and D320 respectively. Even more rare is the name CGR-D53A which is also compatible with this series. SWITCH - Some batteries have a switch on the faceplate. This switch is not connected! Long time ago, Panasonic made a decision to embed the switch into these batteries to help users distinguish full batteries from empty by manually switching from one position to another. Supposedly, this used to aid in locating full batteries in a bag of many during large shoots. These batteries are compatible with a wide range of Panasonic and Hitachi camcorders. 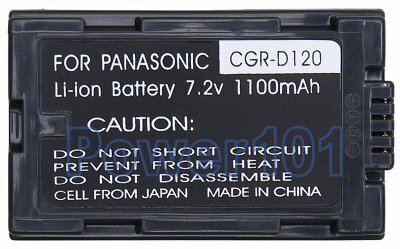 Some of the most popular models compatible with this battery are Panasonic PV-GS9, AG-DVX100, PV-GS12, PV-GS14, PV-GS15, PV-DV103, PV-DV203, PV-DV51, PV-DV53, PV-DV52, NV-DS65. Please check your camcorder in our compatibility list to find the battery you need. These batteries can be charged by any standard chargers compatible with D120 or D220 or D320 or D08A or D16A or D28A. Such as the charger that came with your camcorder. They can also be charged on the camcorder.